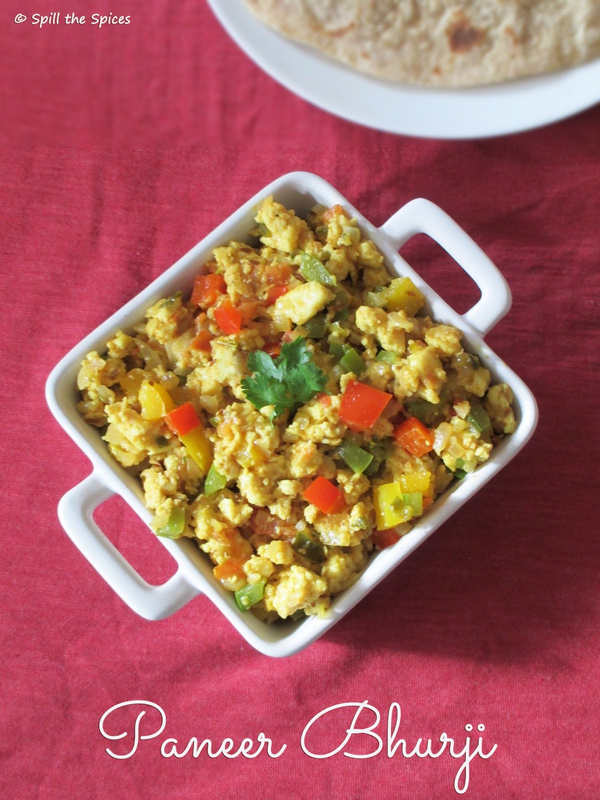 Panner bhurji is a scramble made with paneer, onion, tomato and capsicum. This is one of the quickest and easiest recipe that can be made with paneer as a side-dish for chapathi. This makes a good lunch box option too - just wrap some bhurji in chapathi and have it. You can also use this bhurji as sandwich filling. Making chapathi is no big deal, but what to prepare for side-dish seems a question mark most of the times. So if you have some paneer lying in your fridge, you can quickly whip up this delicious paneer bhurji. Serve hot with chapathi or even naan. 1. Keep the paneer immersed in hot water for 5-10 minutes. Drain well and crumble with hands. You can also crumble them in the mixer. 2. Heat oil and add jeera. When it sizzles, add green chilly, ginger and garlic. Fry for a minute. Then add onions and fry till edges start to brown. 3. Add tomatoes and fry for 2-3 minutes. Add all the spice powders and mix well. Fry for 1-2 minutes. Then add the capsicum and fry till become soft but still is bit crunchy. 4. Add paneer, salt and combine well. Cover and cook for 3-4 minutes. Garnish with coriander leaves. 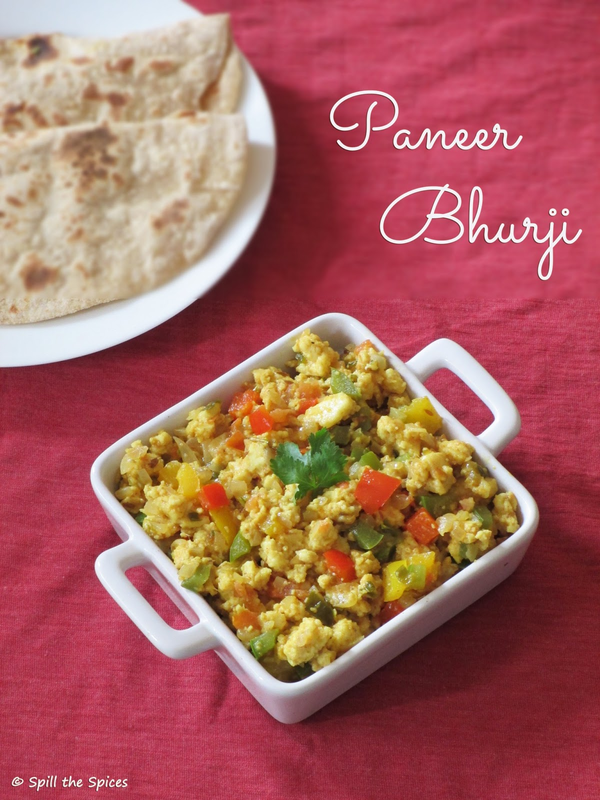 Paneer bhurji looks good I am feeling hungry!! Paneer bhurji looks yumm and healthy..
wow looks tempting.. one of my fav side dish, can b prepared in no time..
Paneer bhurji looks delicious and colorful. 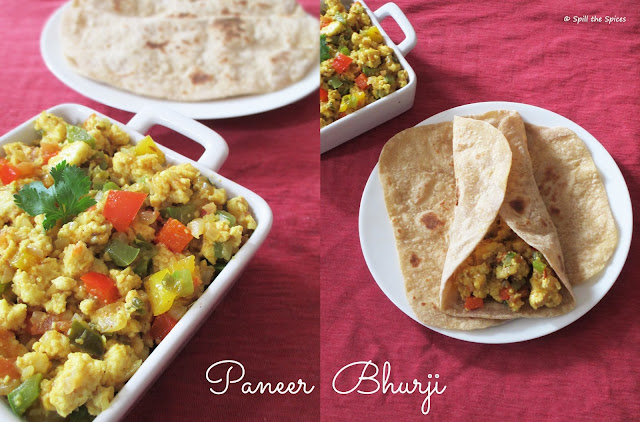 Nice clicks.. Bhurji looks delicious, perfect with roti.. Gives a look of the egg burji. So delicious and yummy. Nice clicks too.